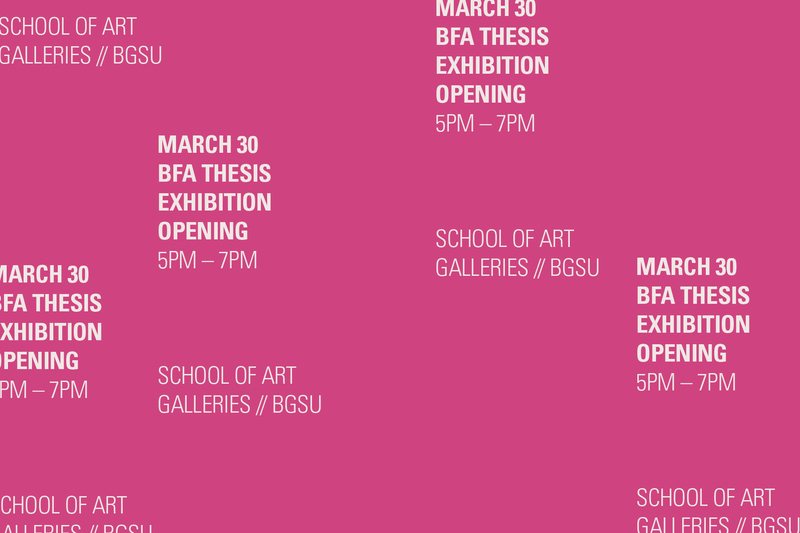 Each spring, the senior Bachelor of Fine Arts students in the School of Art have the opportunity to showcase their senior thesis work at this premier exhibition. These consummate works of the students – ranging from metals, sculpture, ceramics, and painting to glass, digital art and graphic design – fill the gallery spaces in the Fine Arts Center for a two-week show. March 30, the opening night, offers a panel of artists in various fields who will present ‘Where Next? The Future of Art” at 4 p.m., a video animation screening (204 Fine Arts Center) at 5 p.m., an opening reception from 5-7 p.m. in the Galleries, and the awards presentation at 5:45 p.m. This year a special collaboration between the School of Art and the Creative Writing Program will be featured from 6-8 p.m. Friday, April 12 in the Bryan Gallery. Creative Writing BFA senior will read two of their pieces, including an aekphrastic piece that vividly describes a visual work of art by one of the senior BFA art seniors. Admission is free to the exhibition and special events. This exhibition runs through April 14, 2019. * our postcard mailing listed the wrong time, please note 5pm – 7pm is the correct opening time.